Friends and neighbours in Larne are invited to take part in a “big lunch” on Sunday June 7. Organisers say that “The Big Lunch” is a low-cost way to get together with neighbours, with free lottery-funded packs now available to local residents, groups and schools. The event will be sponsored this year by ASDA and Halifax. Larne’s Halifax branch will be taking part in the event and is urging the community to get involved. Branch manager Philip Conley said: “We hope more local people will order the free pack and consider joining in this year. 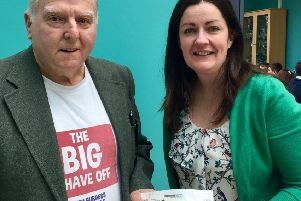 Grainne McCloskey, manager of the Big Lunch in Northern Ireland, said: “Big Lunches can be big or small – they don’t need to cost much because everyone brings something to the table and people are the key ingredient.